Check Lottery Tickets Yourself... Or Else! 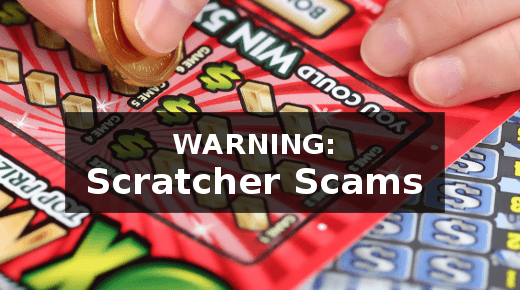 A recent NBC broadcast warned of the danger of dishonest store clerks attempting to steal winning lottery tickets, and various other scratch off lottery ticket scams. You walk into your local store to check your lottery ticket. That could be a scratch-off ticket or a regular lotto game. So you hand over your ticket to the store clerk who checks the ticket for you. “Congratulations” they say – you are indeed a winner. “You’ve won a free ticket – here you go, hope you have more good luck :-)”. You walk away happy. You won. And your next ticket might just be the big one. But you’ve just been ripped off. Now the reality is, this dishonest store clerk just lied about how much your ticket was really worth. Did they scan the ticket? You can’t quite remember – you think so, they went to the machine… I think. I don’t remember hearing the winners ‘chime’ though..? They may have even thrown your ‘losing’ ticket in the trash (until you walk out the door). That store clerk kept your ticket to claim it later. It may have been worth $50, or a couple of thousand! You’ll never know because you’ve just become the latest victim of a scam that is well known to the lottery companies. So well known that their security department uses undercover agents to test out stores from time to time to see if their staff are being honest! Another even simpler way this can work is if YOU don’t even bother to check the ticket at all. Hang around near the lottery counter in any sizeable retailer and you will see this time and time again. Regular scratchers players will often just scratch off the barcode, not even the game panels. Then just hand the ticket back to the retailer to find out if they won. NOTE: for those that don’t know, the retailer just scans the hidden barcode into their lottery terminal to find out if it is a winner or not. This leaves you completely open to being scammed. All a dishonest retailer has to do is pretend to scan your ticket. Then say “sorry dude, not a winner this time”, and throw the ticket in the trash. You walk out none the wiser, and they dig the ticket out of the waste bin and either claim it later themselves or get a friend to claim it. One of the reasons lottery terminals play a winners chime is to try and prevent this kind of scam. But it’s not hard to do. Many lottery terminals are hidden behind counters where they are hard to see. And it’s really not difficult for someone to put their thumb over the barcode so it won’t scan properly. You buy a ticket, try your luck – never mind, it’s a loser, better luck next time right? Except the retailer already knew that ticket was a loser when they sold it to you. Because they just cheated you by checking it before you even entered the store. Remember that hidden bar code I mentioned above that has to be scanned to check for a winning ticket? It’s technically possible to scratch just enough to be able to scan it – by removing a thin line using e.g. a pin (hence the term ‘pinning’) – whilst still leaving the ticket looking unscratched. That dishonest retailer scratched it, checked it, discovered it was a losing ticket and put it aside to sell later! If it was a winner they would have bought it for themselves. How Rare Is All This? It’s impossible to say. The lottery companies themselves are very aware of all these scams and are working hard to prevent them. But they only investigate big prize winners as a matter of course. They can’t possibly investigate all the millions of small prizes that are won every single week. So it’s actually even more likely to happen for small wins where the retailer can simply say “sorry, no win this time” and happily claim your prize. Always sign the back of EVERY ticket as soon as you buy it. Inspect every ticket you buy before you leave the counter – reject any damaged or partially scratched tickets. If you experience anything suspicious please do report it to the lottery company, they have fraud prevention teams who will investigate. You can also simply play the lottery online instead. By all means use a scanner to check for a winning ticket. But if it is a winner, make sure you know how much you have won. For a scratch-off, be sure you understand how that game works. For a draw based game, go online or find a newspaper with the lottery results to check which prize you actually won. And if you’re buying scratchers then DO actually play them as intended. Most of the fun with scratch-off tickets is in actually playing them! So don’t just hand it over – play the game, and see if you won. If you’re not sure how the game works, then either choose a different one or get it explained to you before you play it. Have you been caught out by something like this? Please do add your story in the comments below to help warn other people. UPDATE: This is on the increase – please warn friends and family how to protect themselves. Hit the Like button below – and Share this on Facebook. The more people who are aware of this, the harder it is for them to get away with it. P.S. Did you get my scratchers tips yet? Lots of great tips on improving your chances of winning – oh, and they’re free. P.P.S. If you live in the USA, and play the scratch-off tickets, I also strongly recommend you get Dave’s service here. It’s crazy cheap and will update you every week with the tickets that have the best chance of winning for your state. Don’t play without it! I took an NYS scratch off back and it said already cashed. What does that mean? Just contact the lottery company – it’s probably a mistake. I got a scratcher today it was a $500 winner. I took it to the store but they told me it wasn’t a winner. I told them, no that is wrong, I double checked over and over. He looked it over. I went to another store, was told it wasn’t a winner so she checked it and said not a winner. So now what do I do? I want my 500 bucks. Can’t you just take it to your local lottery office? In the UK this can never happen because scratch cards tell you how much you have won when scratching the game! Sounds like the US lottery companies need to change their scratch cards. That will save having a machine to check you have won, and law enforcement. Simple. Works here anyway. Failing that there are plenty of online websites for scratch cards. The US scratchers do tell you how much you’ve won too, but some games are far more complex than others and people get confused (or don’t even check/play the game). So this is probably happening in the UK too :-). There’s been a few cases in the UK news for the draw based games where shopkeepers have tried to steal winning tickets (not sure about scratchcards). The real worry is how much of it goes undetected. On scratchers, it is impossible for the self service machines to tell you how much you have won. If you do not know how a scratch game is played don’t play that game. How is it going? Just want to say luv ya bro. Please keep it up. Take care. You are the most honest person I’ve ever seen in the virtual world, bro. I got a scratch off today that I checked at 3 machines and they all say “file claim with lottery” – which is supposed to mean I won over $600. The weird thing is after scratching off the whole ticket I didn’t actually win anything. Has this ever happened? Played KENO 10 Spot, 10 consecutive games. NOV 2018 – checked numbers online Jan 2019, 6/10 = $10.00 – retailer checks ticket & it says: Sorry No Winner? #wtf? Why??? I have a CA scratcher and took it to a retailer to redem it. They scanned it and said I had to file a claim form. It’s a $30 winner not a $600 winner so why the claim form? It could be that the ticket roll it came from was not ‘activated’ by the retailer. Rolls are activated just before they go on sale (it’s an anti-theft measure). Unfortunately you don’t have much choice – you can try scanning elsewhere just in case it’s a mistake, otherwise you’ll have to put in a claim. I scanned a Powerball or Mega Millions ticket today at a tobacco store in Illinois and it said see clerk. Ticket was in good shape and relatively new (month old maybe). I took it to the counter, I’m guessing they scanned it but something printed. She told me not a winner and I left. Something didn’t sit right with see a clerk and the way a ticket printed. In your experience do non-winners still print out a receipt when scanned? I don’t know because I don’t think I have ever not been told not a winner at scanner. Well anyways I emailed player assistance at the Illinois lottery website with approximate time and address of store. This does sound highly suspicious, so you did the right thing. Let us know what they say when they get back to you? What printed was a claim form for a win over $599. Good luck in proving you got robbed. Hopefully there was a security camera recording this ripoff. Always ask for anything that prints out. In RI, the machine actually tells you how much you have won. In this state, there are self service machine and apps, to tell you how much you have won, before you hand it over to the store clerk. You should sign the back of the ticket too. Usually when a winner is scanned you hear a cha-ching noise, but haha you always ask for the receipt, and watch out they also put recent loser receipts to the side and give them to you. Always check the date on receipts also. As to the others who have commented… First of all I buy tickets randomly and check them only periodically at self check kiosk. And have won previously only in small amounts. No need to second guess the kiosk it’s always been right. That message was new and I have not known anyone ever say anything about any experience with that message. I was aware any prize over $600 needed to be claimed at a lottery regional office. Again never have won anything personally over $400. So this is not common knowledge about what the reader would say had you won over that amount. And people don’t sign every ticket unless required to. I wasn’t expecting to see anything but sorry not a winner or I would have signed. I am an adult, I don’t lose things and sure I might get my wallet stolen but again I may also win the lottery. Anyhow lottery gave me a claim number and told me call tomorrow during business hours. I tried to scan my scratcher on my phone to see what I won and it says to call 1800 lottery. But I’ve checked 10 times and it seems I won 3 bucks. Waiting for them to open but wonder why it would ever say to call. Could be a few different reasons, but most common seems to be that the ticket roll was not activated by the store. It’s a security measure – makes it much harder for thieves to steal rolls of scratch off tickets and either resell or try to claim them. But if the store forgets to activate a roll it can inconcenience customers too! You will probably have to put in a claim form to get paid, even if it really is only $3. It could be an app error. Maybe the app is not authentic, where did you obtain it? The lottery scanners are more accurate.